WOW this was a fun day!!!!! I’ve always kind of been afraid of spoons. (I really don’t like to sand inside curves) but I finally jumped in and made one then another and another. Took me 4hrs from start to finish sooooooo kewl. I think I’m addicted. 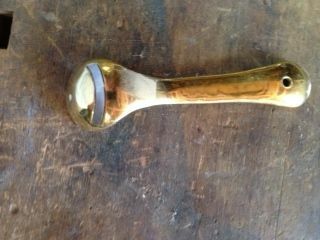 First one I made is maple I put some notches in the handle for a better grip hee hee. I really need to practice on my profile of the inside curve thats for sure. Next one is the funky spatula spoon made from cherry. The final one is walnut and again I really got to come up with a better way to get the inside curve carved in there. Anybody has any tips I would love to hear them. So I bought this carving tool for my 4” grinder many months ago and finally put it on. This is what I used for the rough carving (after i cut the blank out on the band say of course). Then I used my air grinder, dremol, stationary belt sander, rasp, and good old sand paper to finish it off. I put butcher block oil finish and have to head back to the shop here in a minute to put a second coat after I finish typing this. I’ll get better pics after they are completely done I was just so excited how quickly I got them turned out I had to come and post to you guys and gals. Anyway if anyone has any plans for a stationary belt sander that I can make to help shape that would be cool. I’m thinking something that would allow me to use a smaller strip of sanding belt with no backing like the one I already have has. I think maybe this will allow a bit more free flow sculpting. I have not tried this; but, am thinking that an old (STRUDY) tablespoon sharpened will help. Another idea is a small rotary(Dremel) type tool will also help with this. Nice assortment of spoons . Keep doing them and you will develop the skills to make them better and faster and figure out what tools work best . There are several sites that have info on this just search Google and so on . I just love those projects that are fun and let you do whatever it is you feel like doing for the design! These look great, and it sounds like we will be seeing more of them from you down the road. Can’t wait to see what you can come up with. I haven’t tried doing spoons yet, for some reason I just couldn’t put together a game plan on how I would want to do them. So, I can’t offer much advice. I might suggest a card scraper, which should smooth out the curves decently, but you may have to make your own or use a gooseneck to get the right curve. I’ve been thinking about trying out some flap-wheel sanding things, and they may work for this type of sanding… not certain of that though. Great work, and I can’t wait to see these three finished up along with more in the future! Very nice!!! Haven’t made any spoons yet but I love the ones you made. 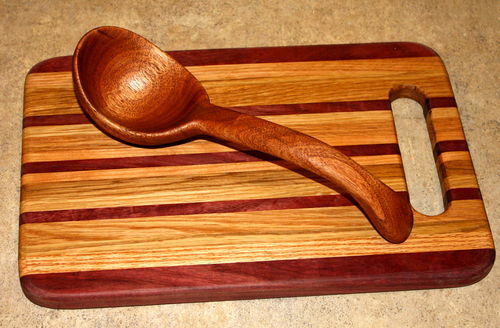 I like how the wood grain on the light one looks like ripples where the inside curve of the spoon is. These are all very nice. Congratulations. Nice work! I’ve only made one in my life, as shown. My sister wanted a specific wooden ladle which she could not find in stores. I’ve wanted to do another since, but haven’t done so yet. You’ve inspired me! Railbuk, Klaus, scooby, Lexi, Charles, and Leaf thanks for all the comments I really did dig it, I spent all night long dreaming of new designs LOL. There are some scoops out their for doing this. Veritas maybe? Those turned out really nice. You may or may not enjoy hand tools, but try a gouge for hollowing out the bowl. The gouge leaves such a nice crisp waxy surface when you get it right, it’s kind of addicting in it’s own. 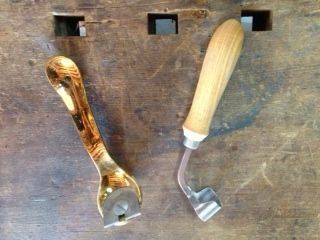 A gouge of a given size and sweep will do a certain range of sizes of spoon bowls more easily and after that it’s easier to have a larger or smaller gouge. A card scraper of the right curve does work well for smoothing the tool marks. I made some spoons thus summer as well. It had more to do with not having any money to buy stock for anything. To do the spoon part I first drilled a hole in the middle as a target to aim for and them I used a 1/4 inch chisel to do the rough gouging then a Dremel to do some smoothing and then sandpaper. 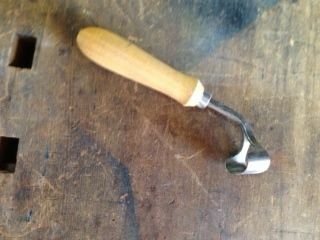 Good idea Klassenl, I was going to try to make a ladle sometime and this would work great with a forsner bit first.